Since my Korean wife and I got married in 2002, one thing she has missed with varying levels of intensity whilst living in the UK, is—perhaps unsurprisingly—television content from South Korea. The Roku doesn’t require a smartphone or tablet to “cast” to it (although this is possible in some cases), but can be operated with its own remote, which we like for its user-friendliness. You add “channels”—basically, apps for accessing content—from the “channel store” to your Roku player, and simply select the one you want to view, from the Roku “home screen”. However, these channels may not always be that easy to find (or identify) in the Roku channel store, or you may not be aware that they even exist… so for starters, here are five “channels” for finding and watching Korean TV content on your Roku in the UK (with caveats where appropriate). Let’s get the obvious option out of the way first… as you’d imagine, YouTube has a huge amount of Korean content available. Technically, the Roku YT channel is excellent, not least because you can “cast” video to your Roku player from the YouTube app on your iOS or Android device. As you might guess, the quality—and yes, legality—of the material varies enormously, and if you absolutely must catch the latest episode of the newest K-drama (even if it’s a ropey off-air capture), I suppose YouTube would have to be your first port of call. This service—owned by the Softbank corporation—provides a legal means of viewing mostly Korean TV drama series and films (with some other east-Asian and Latin American content). It can be accessed via the DramaFever website, apps for iOS and Android, and (appropriately, here) its own Roku channel. DramaFever is free to use (providing you don’t mind an ad being inserted every ten minutes—the same one, and it gets grating! ), although paying up about £8/year for a Premium account removes the ads, and lets you watch in HD if your network speed, bandwidth allowance, etc. allows. 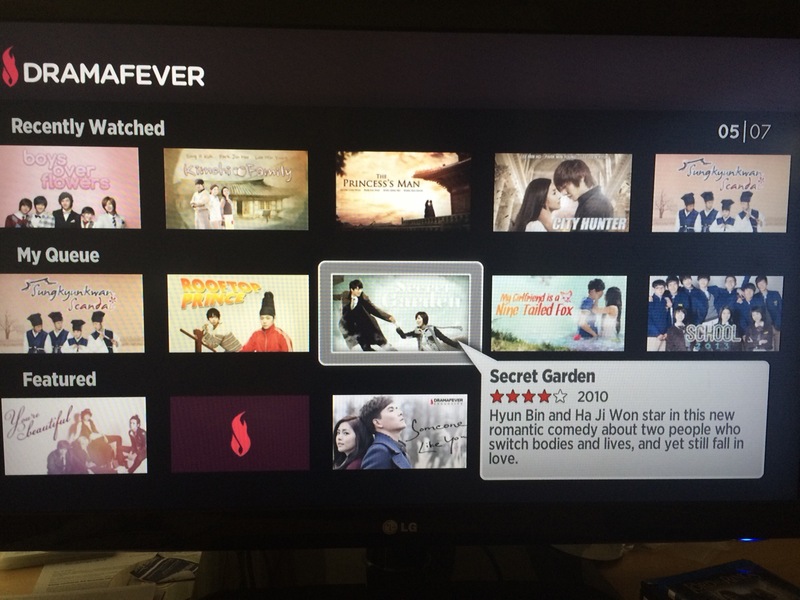 The range of Korean TV shows on DramaFever is comprehensive, from new series still being transmitted in Korea, going back to the start of the 2000s. However… remember me mentioning caveats earlier? It is annoying enough—though perhaps understandable from their standpoint—that DramaFever doesn’t make this dearth of available content clear to UK visitors at the outset. (In fairness, we were aware of the issue when we became a Premium subscriber with them. We just wanted no ads and HD, on the shows that we could watch.) However, even more strangely, there seems to be no rationale for which shows are available to UK viewers. The age of the series, the network which produced it… none seem to have a bearing on availability, though almost none of the brand-new Korean shows are watchable in the UK (and a clutch of series from around 2009-11, are—e.g. Dream High; Secret Garden; Sungkyungkwan Scandal). Because of the “unavailability” issue, I sadly can’t really recommend DramaFever to UK-based viewers as of this time (summer 2015). This is a shame, as the service has a lot to offer… you just have to be in the US to get to it all. the subtitling is, I think, superior to DF’s (partly because Viki’s Unique Selling Point is that the subtitling is “crowdsourced” by teams of (presumably bilingual) fans of the shows). However: overall, as things stand at this time, if you’re UK-based and want to watch relatively-recent K-drama shows in reasonable quality (SD) via your Roku, Viki wins hands-down. Unlike the previous channels above, which take a “video on demand” (VoD) approach, the Arirang TV Roku channel offers a live feed of the service’s broadcasting. I rather like just “tuning in” and seeing what they’re showing at any given time! This is an app for iOS devices (I guess there is an Android equivalent? ), with a matching Roku channel. Its purpose, in theory, is simple: you use its built-in browser to access a website with the video you wish to “cast” to your Roku, and (hopefully) the app makes this possible. In practice: whilst it doesn’t always work (and to be fair, with wildly-differing video-embedding on websites, DRM, etc. it’s a difficult trick to pull off), V&TVC is useful to have around for when you find a “friendly” site. I mention this app/channel here, as all the major Korean TV networks offer video-on-demand services (usually involving payment for users outside the country), so in theory it might be possible to use V&TVC to “send” Korean VoD content to a Roku player. I have never tried this, so it might make an “interesting” experiment for another time! Next Post NaSoAlMo 2015 is go! I don’t know if you tried this site already but ondemandkorea.com, it is really good, but I don’t know if it works in the Uk. Try KORTV app on Apple TV. Also they have website where you can watch bunch of Korean stations for free. Thanks Mike – unfortunately, KOR TV is not available on Roku players, but for Apple TV owners it is definitely an option (as is Viki, incidentally).